A sophisticated beer drinker needs an accessory to create their own flavors to the brew. 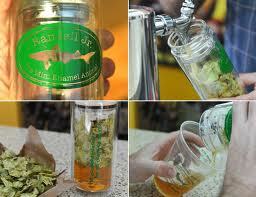 With the Dogfish Head Randall Jr. Beer Infuser, any ingredient in your home can become part of your new favorite beer. If you ask me, I much prefer beer tasting over wine. Maybe I’m just not classy or sophisticated enough to taste the difference in wine, or maybe I like soda so I prefer the carbonation in beer. The fact of the matter is, you don’t need to age beer for more than a decade for it to taste great in a large variety of flavors. And with this Randall Jr. Beer Infuser kit from beer maker Dogfish Head, you can customize your own beer with in just 10 minutes. Most traditional home brewing kit are large, bulky, and requires a couple of hours or days to let the beer ferment. After the beer is ready, there’s also the bottling process which can get annoying when all you want to do is dive into your creation. With the Randall Jr., all you have to do is throw in the hops and whatever flavors you want to try out and add your favorite beer. The tumbler design lets you hold all the ingredients in one portable bottle and shake it all together before refrigerating for 10 minutes. When it’s ready, the top helps you strain out 16 ounces of liquid from the ingredients and you’ve got freshly infused beer that’s custom made for your taste buds.